Platinum Rule DVD by Tony Alessandra – Free Video Clip – Discount! In this powerful, practical and entertaining session, you’ll learn dozens of ideas for dealing more effectively with anybody and everybody you meet. You’ll discover the best ways of building rapport, how to break the ice with strangers, how to quickly and accurately size people up, how to adapt your communication style to make the other person feel more comfortable, and a whole lot more. 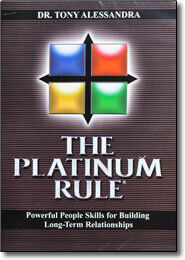 Once you understand and master the simple, yet profound concepts in The Platinum Rule, you’ll be better equipped to build and maintain stronger relationships than ever before. Dr. Tony Alessandra internationally known for his behavioral styles training. He is a widely published author, with fourteen books translated into seventeen foreign languages, including Charisma, The Platinum Rule, Collaborative Selling, and Communicating at Work.